The goal of this work was to move structural health monitoring (SHM) one step closer to being ready for mainstream use by the Iowa DOT Office of Bridges and Structures. 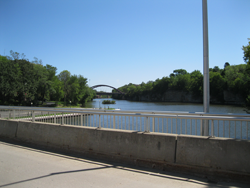 To meet this goal, the objective of this project was to implement a pilot multi-sensor continuous monitoring system on the Iowa Falls Arch Bridge such that autonomous data analysis, storage, and retrieval can be demonstrated. The challenge with this work was to develop the open channels for communication, coordination, and cooperation of various Iowa DOT offices that could make use of the data. In a way, the end product was to be something akin to a control system that would allow for real-time evaluation of the operational condition of a monitored bridge. Development and finalization of general hardware and software components for a bridge SHM system were investigated and completed. 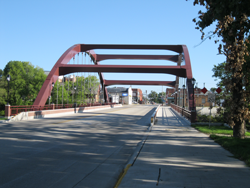 This development and finalization was framed around the demonstration installation on the Iowa Falls Arch Bridge. The hardware system focused on using off-the-shelf sensors that could be read in either “fast” or “slow” modes depending on the desired monitoring metric. As hoped, the installed system operated with very few problems. In terms of communications—in part due to the anticipated installation on the I-74 bridge over the Mississippi River—a hardline digital subscriber line (DSL) internet connection and grid power were used. During operation, this system would transmit data to a central server location where the data would be processed and then archived for future retrieval and use. The pilot monitoring system was developed for general performance evaluation purposes (construction, structural, environmental, etc.) such that it could be easily adapted to the Iowa DOT’s bridges and other monitoring needs. The system was developed allowing easy access to near real-time data in a format usable to Iowa DOT engineers.